Boated as the purest place in the world, Tibet has become an ultimate tourist destination for travelers who are interested in mysterious Tibetan Buddhism, crystal-like lakes, and snow-capped mountains. Lhasa is the center of Tibet which is the primary place for travelers who want to have a Tibet tour. Here, I’d like to share some proposals about Tibet tour with you. Located in the south of Tibet, Lhasa is the center of Tibet with an area of 30,000 square kilometers. There are about 400,000 Tibetans living in this city. And the Galsang flower is regarded as the city flower. Lhasa is divided into two municipal districts including Chengguan, Tuilong Deqing, and six counties including Linzhou, Dangxiong, Nimu, Qushui, Dazi, Mozhu Gongka. Generally speaking, the climate in Lhasa is better than other places in Lhasa, especially in winter. The temperature is high in the daytime, even it is warmer than other places in the north of China. However, it also has the peak tourist season and the low peak season. 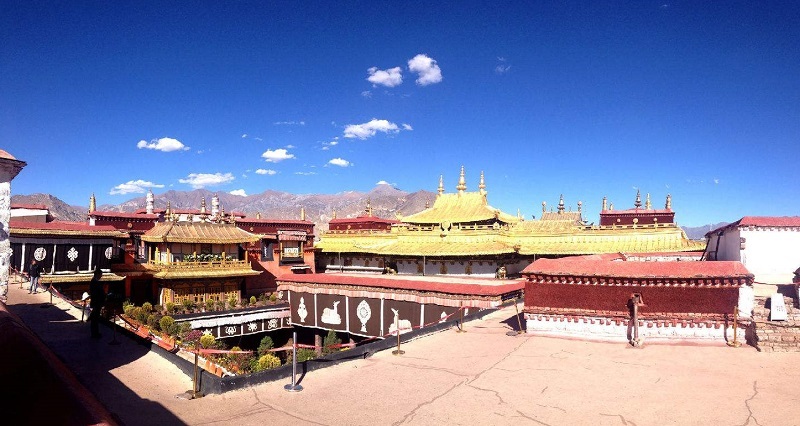 April to October is the peak season and many travelers will travel to Lhasa during this period. It is not very cold and hot. The temperatures in the daytime and at night are totally different. You should bring some warm clothes because of the cold night. You also need to take some sunglasses, suntan oil, and a sun hat because of the strong sunshine in the daytime. As the center of Tibetan Buddhism, a great number of Tibetan style monasteries are dotting on this holy land, such as the Potala Palace, Jokhang Temple, Sera Monastery, Drepung Monastery, Ganden Monastery, Ramoche Monastery, etc. You can also have a tour in nature such as Lhasa River, Namtso Lake, etc. Lhasa is a real paradise for foodies. There are many restaurants in Lhasa city where you can enjoy different style foods such as traditional Tibetan food, Sichuan food, Italy food, Nepalese food, American food, etc. Here are several popular restaurants for you, including Snowland Restaurant, Crazy Yak Saloon, Snow Deity Palace, and so on. Exchanging money on Lhasa is very convenient for foreigners. There are lots of Chinese banks which are available to you. Some banks like Bank of China, China Construction Bank and Agricultural Bank of China can provide this service. Normally, you should exchange your money in the bank during the working hours which is from 9:00 to 12:00 am and 15:00 to 18:00 pm. If you want to convert your currency, you can get to 33 East Jinzhu Road. Compared with the past, Lhasa has a rapid development. Free Internet covers the most areas of the city. When you arrive at your hotel, you can use the free Internet provided by the hotel such as the Jardin Secret Hotel, Lhasa Sheraton Hotel, Brahmaputra Grand Hotel and Tibet Hotel. So don’t worry about the Internet. If you travel to Barkhor Street, you can see lots of pious pilgrims doing circuiting here. Because the holy Jokhang Temple is the center of this street. In order to seek blessings, they come from remote areas on foot. Sincerely and determined!